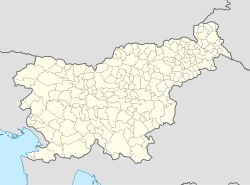 Podkočna (pronounced [pɔˈtkoːtʃna]) is a settlement in the Municipality of Jesenice in the Upper Carniola region of Slovenia. A railway halt of the Bohinj Railway, the Kočna Rail Halt (Slovene: Železniško postajališče Kočna), is located in the village. This article about the Municipality of Jesenice in Slovenia is a stub. You can help Wikipedia by expanding it. This page was last edited on 29 March 2017, at 03:17 (UTC).